Blacklight Metropolis is DJ Basilisk’s contribution to the fifth edition of Global Goa Party, a virtual event organized by Marsh at the Goatranch to simulate an entire night of music from the early years of the psychedelic trance movement. This time around the year is 1997 and the golden age of Goa trance is in full swing, blasting revelers into limitless dimensions of sound with scintillating kaleidoscopic sounds and twisted techno-shamanistic rhythms. Reprising the nocturnal explorations of Moonshadow and In Exile, this expertly mixed collection of mind-bending classics explores the darker side of the genre while journeying through the deepest part of night from 1:30 to 3:30am. 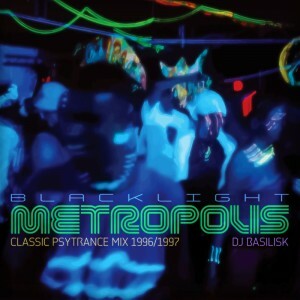 Dedicated to Black Light Activists (BLA), one of Toronto’s pioneering psytrance organizers, and Mark at Metropolis Records, the shop where I bought my first psytrance records. Recorded at Head Shop Studios, Changhua City, Taiwan, with Traktor 1.1.1 and a battered old Korg Nanokontrol. Vintage analog photography and digital design by Basilisk. My first exposure to Goa was Trancentral Four: A Trip to Goa mixed by Tsuyoshi Suzuki released in 1996. Having bought the first three in the Trancentral series and loved them, I just picked up the fourth one without hesitation, even though I had never heard of any of the artists on it. I was hooked on Goa from my first listen to that comp. It’s hard to believe most of the music on this mix is 18 years old. The tracks are great, the sound is great. I’ve got some of these, but there are some good ones on here that I don’t have. Haven’t heard some of these in years, brings back such incredible memories! Great mix Basilisk! Muito feliz em saber que o bom e velho som está vivo , são grandes trabalhos de verdadeiros mestres, cientistas, engenheiros do som! Nada disso jamais deve ser esquecido. the set are awesome … but why is not on .wav format?? too big ?? have a great day !! Great to hear a collection of Goa Gold in mixed form. Thanks Xander! So many favourites in this one: Sacred Fist and Telepathic Combat are just brilliant. Space Puppy is one of my all time favs and I have it on a CD from Moonshine Records (Trance Psyberdelic) released in 1995, one year before I officially discovered the Psy/Goa sound in the record shop. GREAT mix! Thanks a lot!! I have all your classic mixes put on the site. It transport’s me back to 1995-2000 psy party days in Pune. Those were the days and the sounds, which will never come back again. Feel’s great that I was part of the experience. Great effort DJ Basilisk! Best wishes from Poona! Great mix. And I believe it’s definitely on the verge of goa and psytrance (I tend to draw the line between goa, sounding in the vein of Pleiadians, BPC, Dimension 5, Chi-AD, Asia 2001, etc and the likes of Green Nuns). Very dark and twisted mix. It was pleasant to hear Darshan, my favourite oldschool goa act, as well as other darker projects (early Xenomorph, Orichalcum/The Deviant, Cydonia, Orion and many others). Great job on making it thematic from beginning to end. Really Nice track Billy, GOtta go back too it! how is Raja Ram Rothfeild and Graham WOOD doing? I got into Psy Trance listening when I started listening to early Infected Mushroom, SFX (1985-89 Astral Projection) MFG, and the Muses Rapt. It was nice to rekindle the sounds from Goa’s golden years. When I listen to these tracks in makes me think of my now obsolete and/or difficult to find collection. Surprised that California Sunshine, MFG, Man with no Name and Shiva Space Technology didn’t make the list. Any chance of a cue sheet? I love DJ mix play,it was helpful ,brilliant post. The start isn’t that good, but then, oh yeah..
allen Android Tastatur Entwickler hört Goa kommt in unsere Welt uw.